Worth going bananas over still? Much fuss was made about Donkey Kong Country when it was first released, and with good reason - the CGI visuals were a cut above what SNES owners were used to at the time and the game seemed to give the Super Nintendo a much needed second wind. 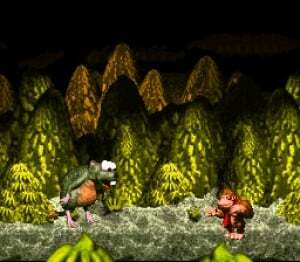 Donkey Kong Country is a side-scrolling platformer. Using DK and Diddy, you have to run, jump, and swing your way through 39 levels filled with lengthy jump sequences and hazardous enemies. DK and Diddy can dispatch enemies by rolling through them, pouncing on them, or by tossing barrels at them. Each character has his unique strengths. DK can dispatch larger enemies that Diddy merely bounces off of, while Diddy can jump a little higher than his bulky cousin. It isn't the most original blueprint, but it works. The different things you can do in each level help keep the journey lively. Each stage has its own theme, whether it's swimming underwater, riding in mine carts, swinging from vines, or launching your character out of barrel-cannons. There are secret passageways that lead to bonus games where you can earn bananas and balloons, which ultimately translate into additional lives. In many places, you'll find crates that contain animals that you can ride and control - anything from a rampaging rhino and a bouncing frog to a swimming swordfish and a flying ostrich. Over a decade has passed since this game's original release and although some of the shine has dulled it still manages to impress. 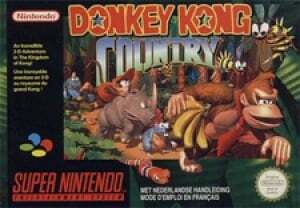 Although it's not in the same league as the sublime Super Mario World, Donkey Kong Country still ranks as one of the better SNES platformers and is a worthy download on the Virtual Console. I love Donkey Kong Country 1 & 2. Aging with time be hanged. The gameplay perseveres. Just started playing this again, and I'm glad I did. Still difficult, and still looks great! I never played the second or third ones in the series, so I may go back and play those after I finish with this. That was a realistic, short, and perfect review. I downloaded this today. It's pretty cool. 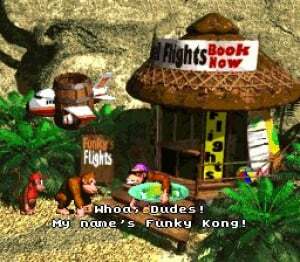 One of my 3 favorite DKC titles. This is a masterpiece, the second is better yet (on a fine line), and Returns is one of the best retro-revivals I've ever played (definitely in-league with New Super Mario Bros. Wii and Sonic 4 EP 1). To me, DKC3 is nice, but there's something about it that just makes it not quite as good as the other three. A 9 is to generous for this game. This game is way overrated. I completely disagree. If there's only a handful of SNES games deserving a perfect 10, this is definitely one of them (along with Super Mario World, Super Metroid, and Zelda: A Link To The Past).